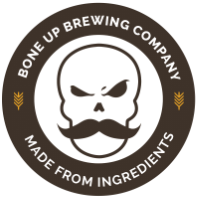 Stats: Pat Signal - Bone Up Brewing Co.
Color: Not quite mahogany, maybe walnut? Brewers' Notes: We're pretty big on NERAX around these parts (if you've never been, it's easily one of the top three best fests we've had the pleasure of attending) so we got our plannin' caps on when we heard that this year's iteration was imminent and we cooked up somethin' that's just made to be on cask! And since we made this lil' ol' brown ale with cask in mind, we pretty much had to name it for the biggest cask fan to grace our barstools: our friend Patrick! Anyway, you ain't gotta be Patrick or even know him to respond to The Pat Signal because we've got enough deliciousness to go around for all y'all, so come on by!